I was so nervous for someone to take over after the genius that was Murray Gold, as his music was a huge part what made Doctor Who what it was. But it seemed fitting that with the show's fresh start with series 11 brought on a fresh musical mind, and I went in with an open mind and open ears. Akinola did NOT disappoint! While his music is entirely different than Gold's, it's so gorgeous and fit the scenes in the show so well, which I'm a huge sucker for. Well done, Segun. Thanks for giving us and the show itself a brilliant score! Can't wait to hear more in the future. I wouldn't want to be the composer to follow in Murray Gold's footsteps. Gold's whimsical and very iconic themes defined the modern era of Doctor Who! While Akinola is a great composer, his style often dosn't quite match what we are seeing on screen. Where Gold would present the audience with an action packed score to set the tone, Akinola seems to rely (almost to heavily) on long drones. There are excellent moments (the tracks from Resolution for example), but the majority feels like there is something missing. 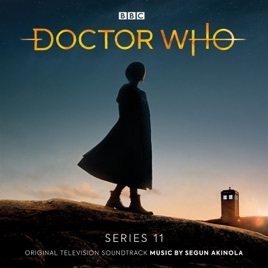 And I have to take off a star because the FULL version of Akinola's fatastic take on the main theme (with the complete "middle 8) is not on this soundtrack! WTH?! It was used in the first full trailer, but we don't get it here?! There is definite room for improvement. This is not a soundtrack to try listening to if you're in need of getting to sleep! There's such energy running through every track, not least that opening theme, returning closer to its roots than any composer's dared in years. Outstanding!